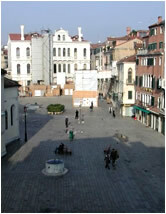 Ca' Formosa Guest House Venice > Location > Our fifteenth century town house is perfectly located in the heart of Venice. Ca' Formosa Guest House is well-appointed in central Venice in the quiet sestiere of Castello, allowing our guests a peaceful stay in budget accommodation only minutes from the magnificent Piazza San Marco, Ponte Rialto and the gothic splendour of the Doge’s Palace. Click here to see the map of the ideal location in Venice of our traditional guest house, in full screen. Venice can be tricky to navigate, so here are some directions to help you find your Venice accommodation however you choose to arrive. By Plane: From Marco Polo International Airport, take the Alilaguna shuttle service and get off at San Zaccaria boat station. From here head up Calle de le Rasse, at the end of which you turn left and then right towards San Giovanni Novo. Keep the church to your left and walk over the bridge and head for Campo Santa Maria Formosa. Cross the bridge in the south east corner onto Ruga Giuffa and take a left up the small alley. Cá Formosa Guest House is at the end of this quiet Venice side street. By Car: Taking the SR11 road over the Ponte della Libertá, leave your car at Tronchetto or Piazzale Roma car terminals on the west of the island. Take the Vaporetta 82 water bus from Piazzale Roma to San Zaccaria boat station, which takes around 30 minutes. From there follow the directions given above. By Train: Arriving at Santa Lucia stazione, take vaporetta no.82 or No.1 water bus to San Zaccaria boat station and proceed as above. You could also take a private water taxi, although you should make sure you agree the cost up front.